Intertek, the company which has tested CAPA parts for more than 26 years, announced Friday it had received an exclusive license to run the Certified Automotive Parts Association program worldwide. CAPA will transition into “a non-profit standard development organization, focusing on maintaining CAPA standards in support of its mission,” Intertek wrote. Intertek will handle everything else, according to the news release. “The agreement grants Intertek exclusive rights to operate the CAPA certification program around the world, which includes managing daily operations, administering certification marks and labels, performing marketing activities and conducting testing and inspection services,” Intertek wrote. A separate news release noted the “compelling opportunity” for Intertek to grow CAPA’s scope to “a wider range of replacement parts” and take the program to countries without any standards for aftermarket auto parts. Collision Week has reported that CAPA Executive Director Jack Gillis has retired; attempts to reach Gillis and Intertek early Friday evening to confirm this were unsucessful. However, a news release refers to Gillis now holding the executive director post in an interim capacity. It’ll be interesting to see if the publicly traded Intertek (London Stock Exchange) adds more rigor to the program out of consideration for its brand. CAPA prides itself on being tough; 26 percent of submitted parts flunk its VTF B test the first time, and it has in the past reported “significant deficiencies” in parts it hasn’t certified. However, Consumer Reports and repairers in a BodyShop Business survey have still raised quality issues about CAPA parts, and Intertek will have to own such complaints in the future. Currently, Intertek audits factories and tests the parts up for consideration. If both pass CAPA’s bar, the entire run of that part is considered certified, according to CAPA. The manufacturer doesn’t have to recertify a part which will fit on, say, five model years of a vehicle any of those additional years, though CAPA does have some other checks in place during and after the run of a part. 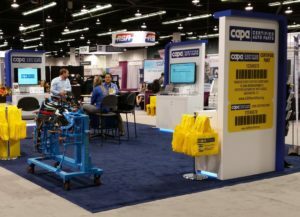 “CAPA continuously monitors certified parts through its regular in-factory inspections; marketplace monitoring including random material testing or vehicle test fits; and the CAPA complaint program,” CAPA has explained. Whether this is sufficient enough to ensure a part matches the OEM edition or maintains that quality control through the entire production run hasn’t in the past been Intertek’s problem. It’s just a contractor inspecting whenever and whatever CAPA pays it to inspect, submitting a report, and going about its business. CAPA has defined the standards and publicly classified parts as good or bad based on those results. While CAPA sounds like it will still define the overall standards under the new arrangement, Intertek’s role as administrator and champion of the program now seems to tie its brand to the quality of the millions of CAPA-certified parts released into the marketplace.